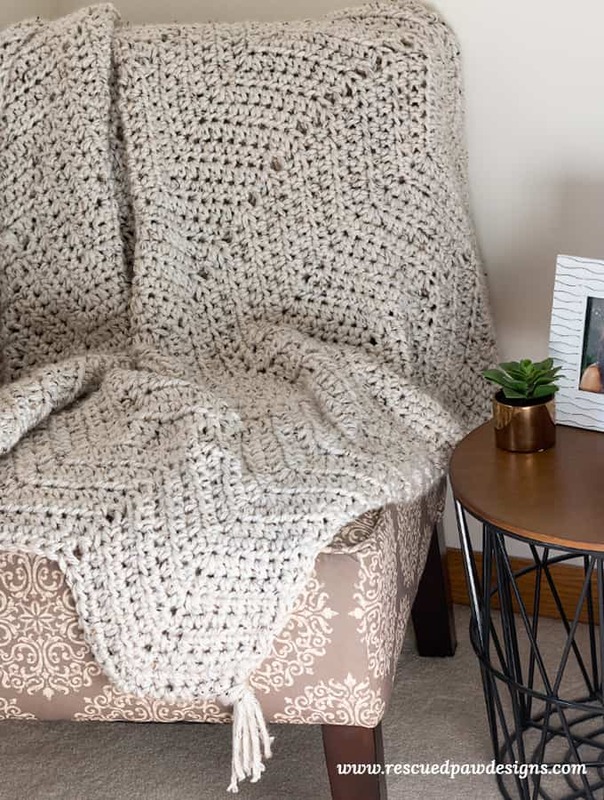 Want to make a crocheted blanket fast? 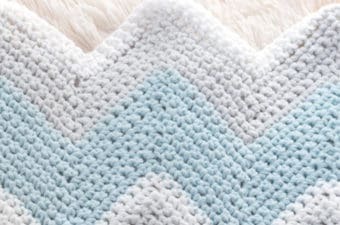 Learn how to crochet a chunky chevron blanket today with the free pattern below and you’ll be on your way! 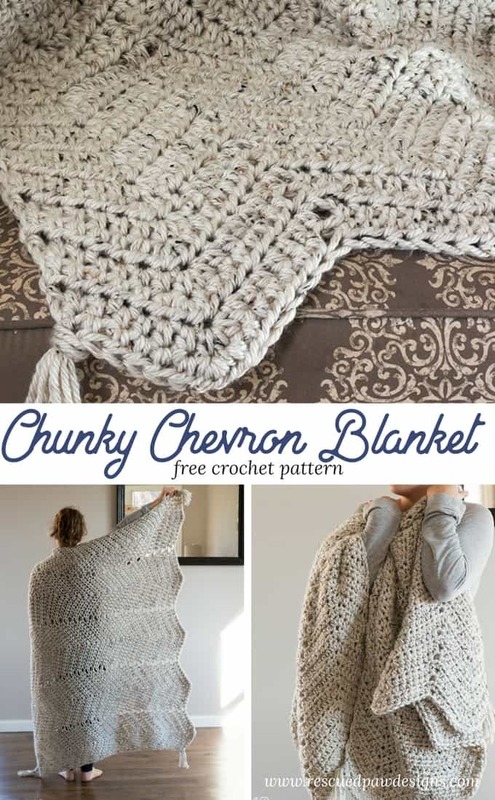 You’ll love making this Super Fast Pattern using CHUNKY YARN ! 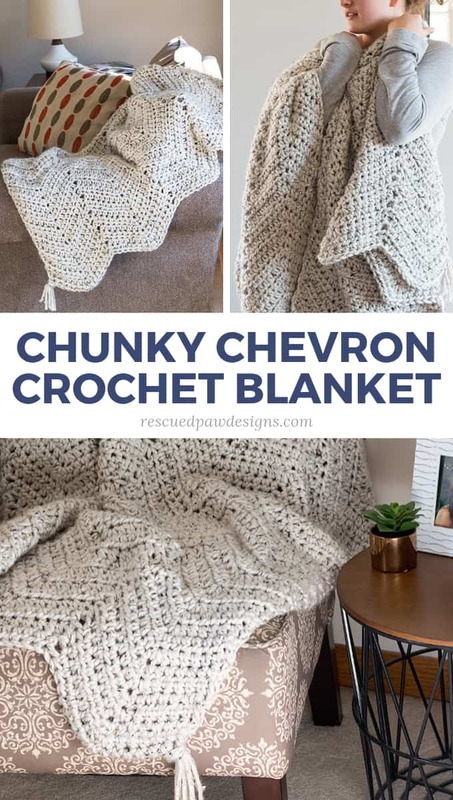 If you love chunky yarn, love easy crochet stitches and want to work up a crochet blanket fast then this is the chevron pattern for you!! This chunky ripple pattern is an easy project that works up pretty quickly. 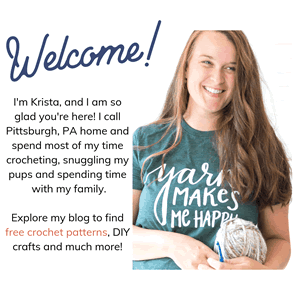 If you’re looking for more quick projects then you might also like my post about free crochet patterns that use bulky yarn. 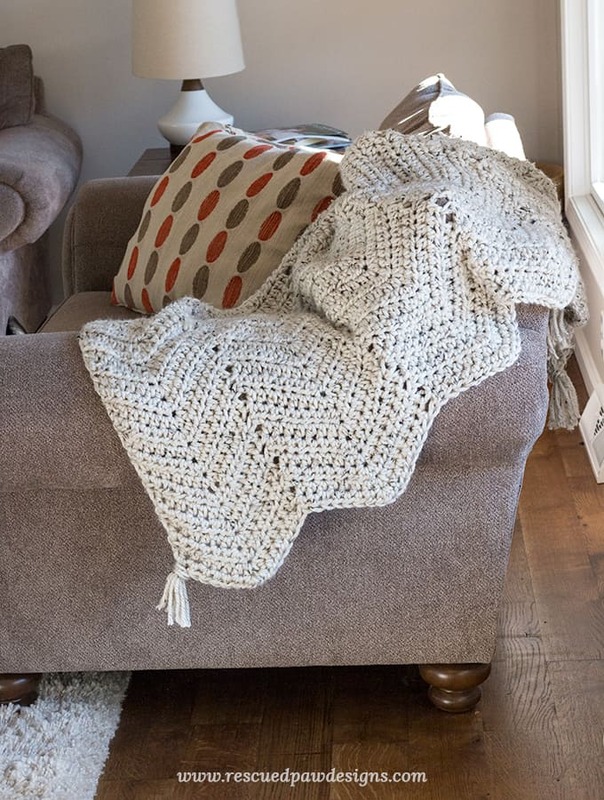 Make this Chevron Blanket with a HALF DOUBLE CROCHET STITCH! This is a half double crochet chevron pattern which is a little different than most of the other chevrons you may see. I previously had designed a single crochet chevron which you may remember from before. The reason I decided to use the half double crochet is because the hdc stitch in combination with the bulky yarn is because it works up so QUICK! 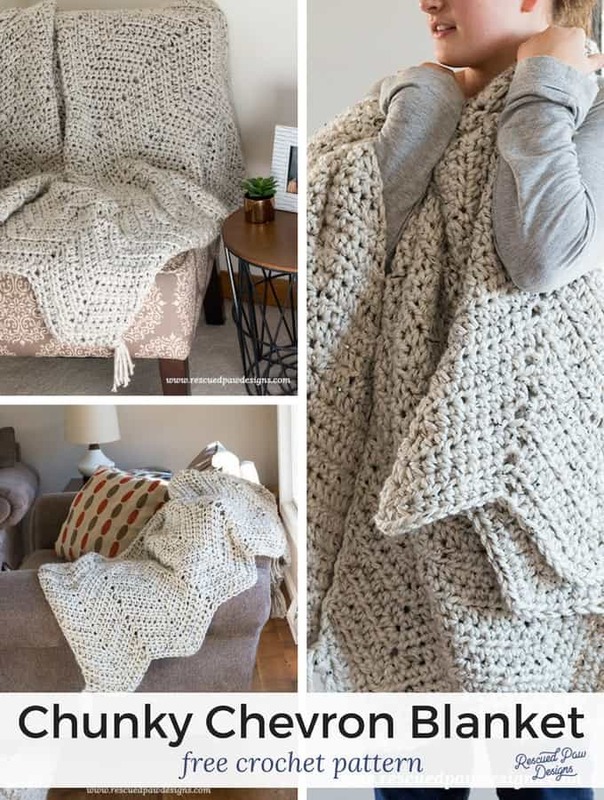 This is a a great pattern to mindlessly watch Netflix with, carry with you anywhere or crochet up quickly if you’re in a time crunch because of the ease of the stitch. You’ll love it… Promise! You will also need Hometown Yarn by Lion Brand in Aspen Tweed which is a beautiful neutral color to work with and goes with most any decor! 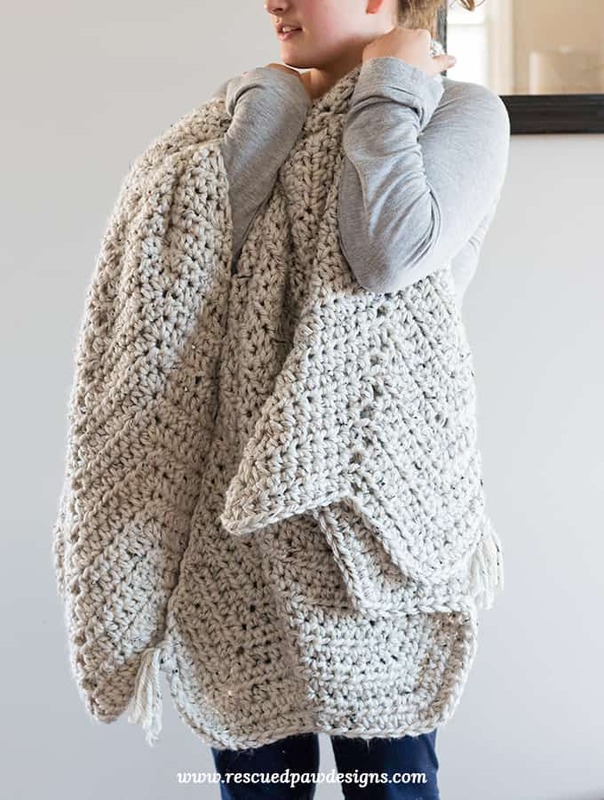 This particular bulky yarn is so so soft and can be found pretty easily at most craft stores and online too which is great if you want to work on this asap! I actually started this almost 2 years ago and it has been sitting waiting to be posted! I could blame a lot of thing on this beauty of a chunky chevron blanket never being posted but really it’s because it was shamelessly buried in my yarn stash basket. 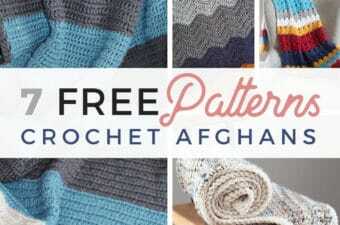 Yep, 2 years buried under yarn..
Are you ready to learn how to crochet a chevron blanket? If you’d rather have a AD-FREE PDF that is also available for a low price. Otherwise read on down for the pattern below. Have Fun and Happy Crochet Blanket Making! As written you will need less than 840 yards of Lion Brand Hometown Yarn. I used the colorway Aspen Tweed. Size N crochet hook 9.00 MM. I prefer Boye Hooks. to adjust the size work the starting chain in a multiple of 17 (51,68,85,102,119,136,153,170,187,204,221,238,255,272,289,306,323,340,357, etc.) and add an additional 16 chains to whatever multiple of 17 you have chosen. Selling: You may sell items (not in large scale) made from patterns on Rescued Paw Designs unless otherwise stated. If you choose to sell items made from this pattern please link back to me at www.rescuedpawdesigns.com for credit. Please do not use my pictures to sell your items. PLEASE DO NOT COPY, SHARE (in part or whole), ADJUST OR RESELL MY PATTERNS. A link with ONE small picture (not the long image) is OK with no additional overlays or text. FOUNDATION ROW: ch 101 or whatever length you have chosen. last two remaining ch’s together (aka hdc2tog), turn. ROW 2: ch 1, starting in the first st hdc2tog, 1 hdc in each of next 5 st’s, hdc 3 times in next st, *1 hdc in next 7 st, skip next 2 st, 1 hdc in next 7 st, hdc 3 times in next st. Repeat from * across until you are left with 7 st then hdc once into each of the next 5 st’s then hdc those last two remaining stitches together (aka hdc2tog), turn. ROW 3 – 47: repeat row 2. Finishing: Fasten off yarn and weave in loose ends throughout blanket with yarn needle. You may need to block your blanket to get it to lay flat. I added a small amount of fringe tassels at each corner by cutting 4 12″ pieces of yarn. This is optional. A tutorial on how to make fringe can be found “here“. 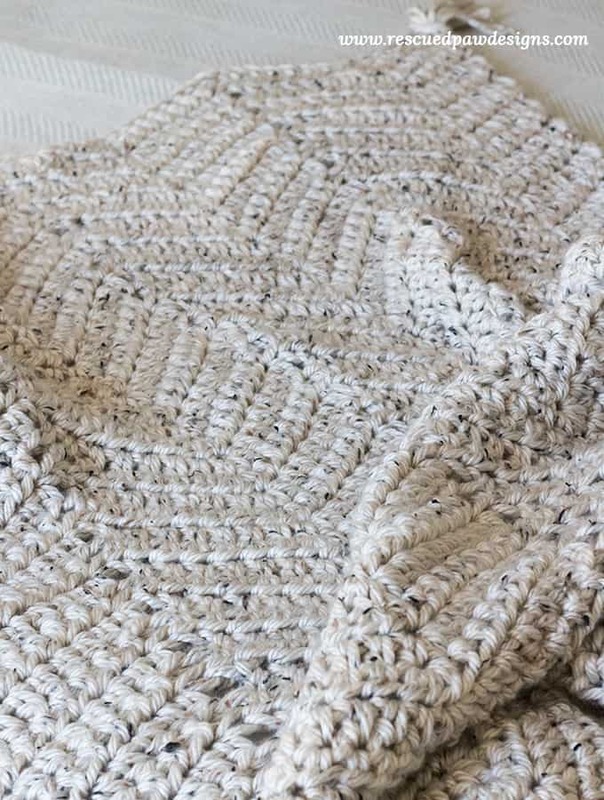 You finished your chunky chevron blanket! About how many balls of Hometown yarn? You will need approximately 840 yards of this yarn so it would depend on what size ball (and color) of the hometown yarn you are going to use. I suggest checking the package so you get the right amount of yarn. Row 1 at the end says 2school tog. Probably should be 2hd c tog? hi ! i have a question ! I am using bulky yarn, size 6, and a 9mm hook…. The the stitch height matches the gauge you have provided. However, the length is not. I am getting about 6 stitches per ever 3 inches. I crochet pretty tightly and I wouldnt be able to go any tighter without ruining the blanket lol… are you sure this gauge is accurate ?? 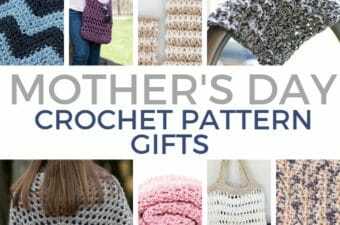 I’m guessing in your abbreviation section hdc= single crochet is supposed to be hdc= half double crochet. is 840 yds correct?? most skeins of this yarnis 64 yds.. that would be 13 skeins.. just checking..
Yep! You will need 13 skeins! Happy Crocheting! It is very easy to skip stitches or add stitches with chevrons. I would suggest using stitch markers or double checking your #’s. Happy Crocheting! I am having the same issue as Marry. I have done this 7 times and never have two stitches left over. I crochet 7 and that is it. I’m starting with 51 and adding 16. I fixed the wording in the pattern to make it a little easier. You will repeat the pattern from * until you have 7 st’s then hdc once in each of the next 5 then you will be left with 2 st’s which you will hdc2tog.